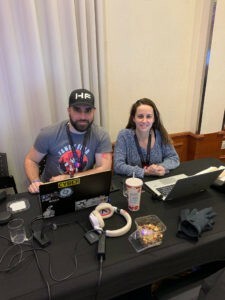 On November 3, Jean-Philippe Décarie-Mathieu, Coordinator of the Security Operations Centre and Marie-Ève Royer-Laliberté, IT Project Director at Commissionaires du Québec participated in a computer contest unlike any other. The goal was to obtain through the web information and clues regarding active cases of missing persons in Quebec as part of the 2018 Hackfest. Marie-Ève and Jean-Philippe took the first prize, accumulating the most points among the 11 participating teams. Points were awarded according to the number and relevance of the information collected. This contest, organized by Trace Labs, a Vancouver-based non-profit organization specializing in the search for missing persons, aims to use the talent of web specialists to find relevant information for the Sûreté du Québec and the Service de police de la Ville de Québec, in order to provide them with leads to assist their investigations. The relevance of this competition is no longer to be demonstrated, since at each of its editions, cases have been solved thanks to information found by participants.